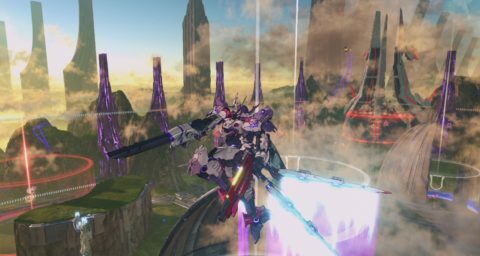 Over at 4Gamer, they have a new interview with one of the developers behind the upcoming arcade mecha game Starwing Paradox. Released later this year in the Japanese arcades, it utilizes the talents of Yoshiyuki Sadamoto for the character designs and Ippei Gyoubu for the mecha. Up until now, the game has been looking great but we now finally have some gameplay footage of the game in action (shown below) and now I am not so sure about it. Put simply, Starwing Paradox looks a lot like a multiplayer version of Another Century’s Episode R on the PS3 and that’s not good really. Admittedly, Starwing Paradox has a different control setup and a bespoke motion activated cabinet but even then, this kind of aerial ranged combat approach with analog boosting, as per the flawed Zone of the Enders games, doesn’t fill me with much hope. However, the only thing here that gives me hope is that Byking is behind Starwing Paradox. They are a solid developer that made the initial Gundam Extreme Versus games, as well as crazily awesome games like Gunslinger Stratos. Admittedly, Byking also made Magician’s Dead and that was mostly terrible but I am still hoping that Starwing Paradox will turn out okay, despite this somewhat worrying gameplay footage.